Darlene with you today and Sunday's are my day to share a new creation using the fabulous new dies from Tutti Designs. If you haven't taken the time yet to check out this new line of dies ... please do it NOW! Their second release just became available the beginning of July and there are some AMAZING dies for Fall and the upcoming Holiday season! 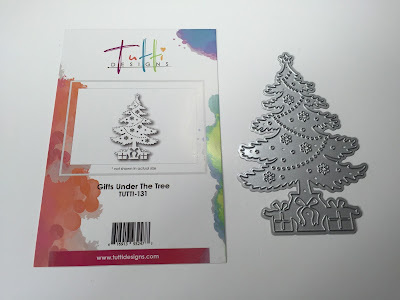 Today I decided to create a quick, easy & beautiful holiday card using the Tutti-131 die called 'Gifts Under the Tree'. There are actually FIVE different tree dies in this latest release ... I will share pics of those with you at the end of this post. I'm SURE you'll want to pick a couple (if not all) to use on your holiday cards. 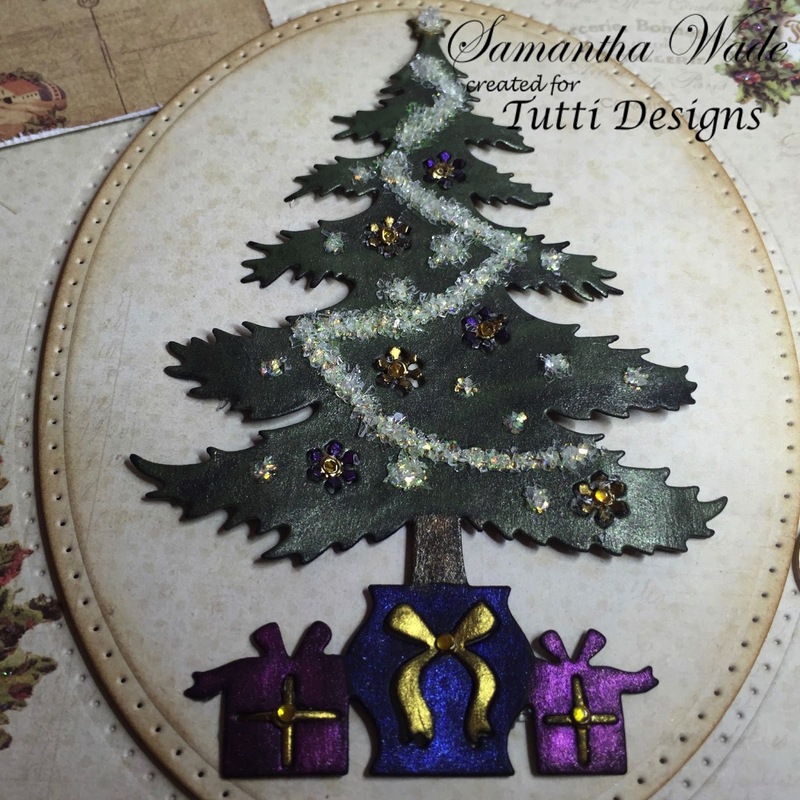 By simply using a winter embossing folder for the background of my card, I could let this tree shine in all it's sparkle glory. After die cutting from white card stock, I simply applied white glue, then Christmas green glitter to the tree, brown glitter to the tree trunk, gold glitter to the star and red glitter to the pot & gifts under the tree. 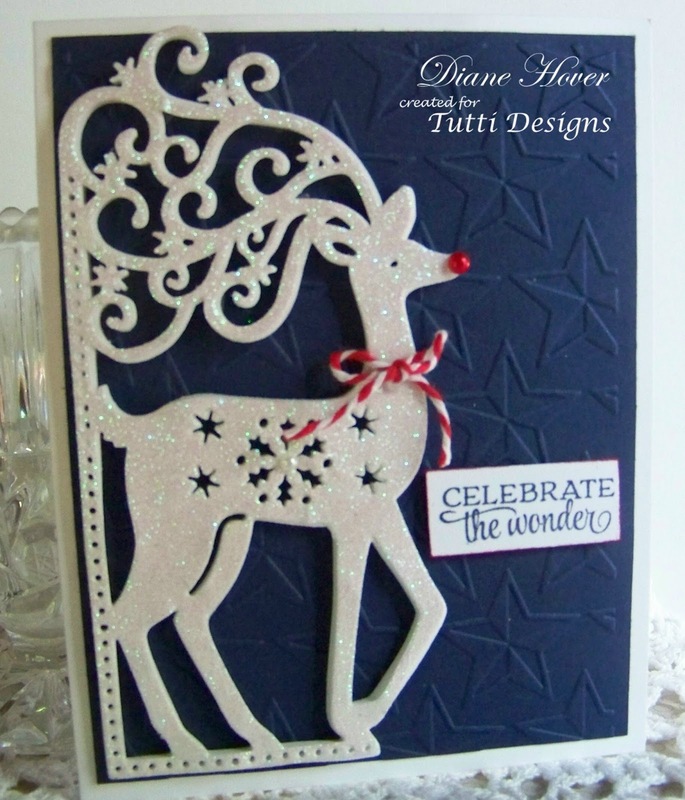 As you can see, the snow flakes, ribbon and bow pop out once die cut. 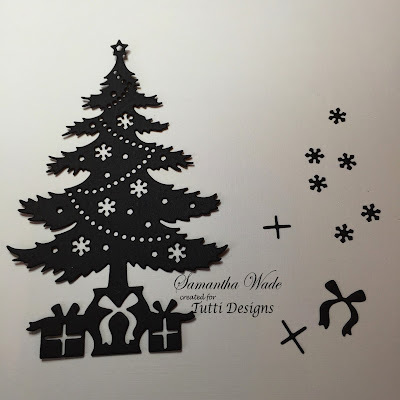 After I had my tree all glittered and dry, I added the white snow flakes back in and die cut the ribbon/bow from gold metallic paper and added them back into my die cut. A few little touches of red Stickles to mimic ornaments and my card was ready to brighten someone's holiday this coming season. As I mentioned, there are FIVE different holiday trees in this latest release, available for purchase at the Tutti Designs Store. Here's a quick peek ... you can click on the images for a better view. THEN you'll want to be sure and pop over to the store to make your purchase before they are out of stock. So many beautiful dies available and the prices are MORE THAN REASONABLE!! Well, that does it for me today! 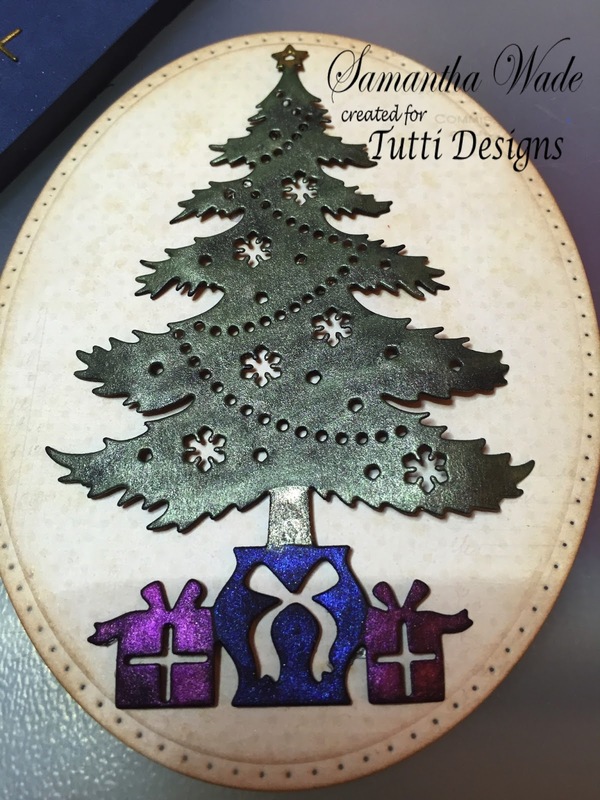 Remember, the design team has a new, inspiring creation using Tutti Designs dies waiting for you on the Tutti Designs Blog each and every day!! Please pop over and show them some love. Today is Fir Trees Arch Scene, TUTTI-130. The die has been cut twice. The trees have been coloured green and cut away from the scene. 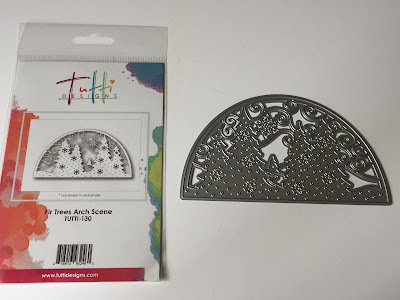 Then 3d onto the white pearl die cut. Add snow balls and sparkle to the tree and glued the other die cut parts to the tree. Glue onto a background, which i have made from pixie powders. 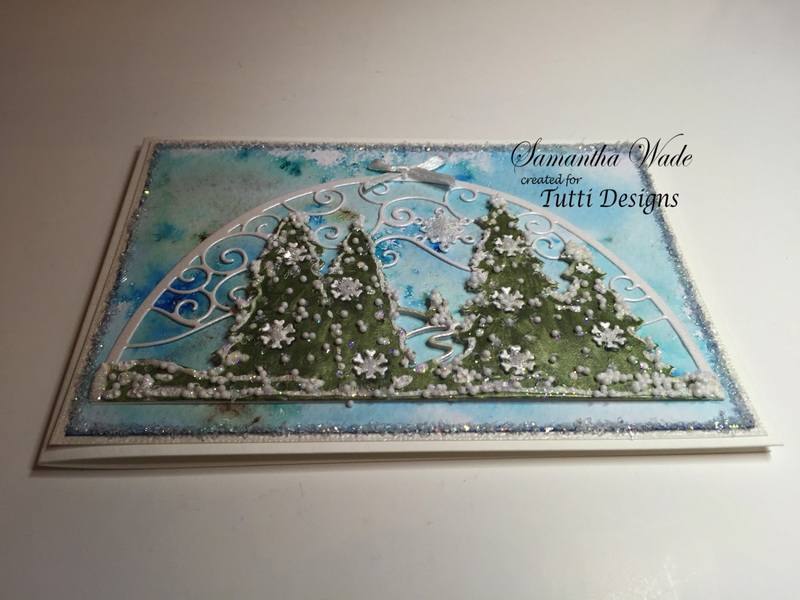 Add glass glitter to the edge of the background and a white bow as a finishing touch. A very sparkly Christmas scene. Another gorgeous Christmas die to share with you today. I think this die could very easily be turned into a wedding card as well! 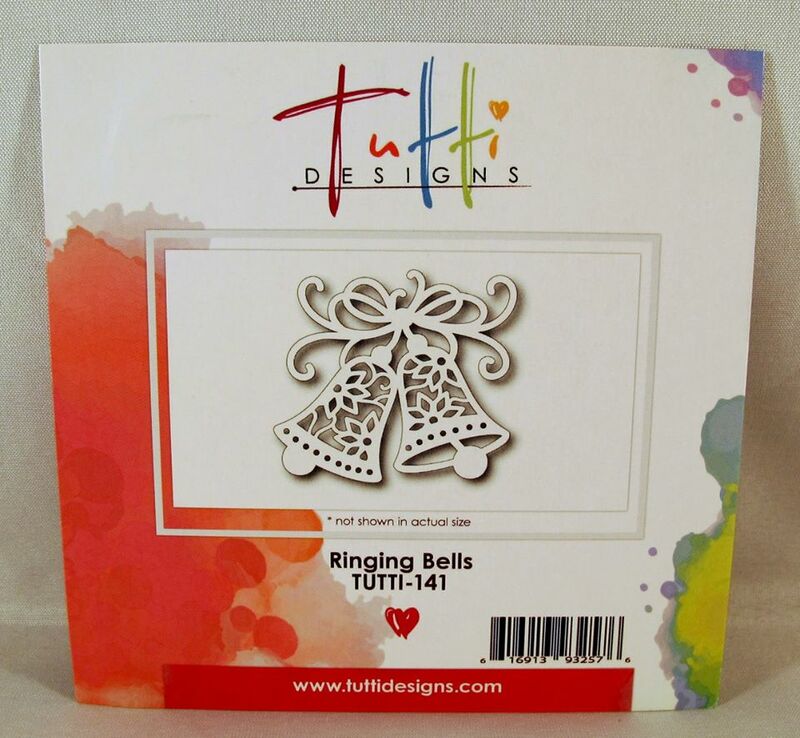 I die cut the bells from an embossed silver and white designer paper. Then I popped the bells up om a blue shimmer paper. The background is all silver glitter paper. then used my trimmer to trim the excess away! 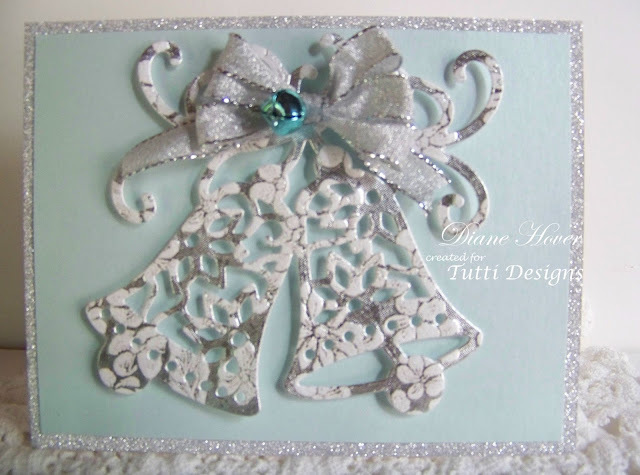 To finish a silver bow and a tiny blue jingle bell were added. Hello everyone, Pam Simpson here today as it`s Wednesday! Sharing a Pentagon shaped card.. Using Bright Candles & Arched Fir Branch. These Bright Candles have been cut in white card..Next adhered to green, using scissors I cut around the shape..Using double sided foam tape to raise up on my Pentagon shapes, which has been embossed in a folder. Added glitter shapes back in after I cut these in the die. 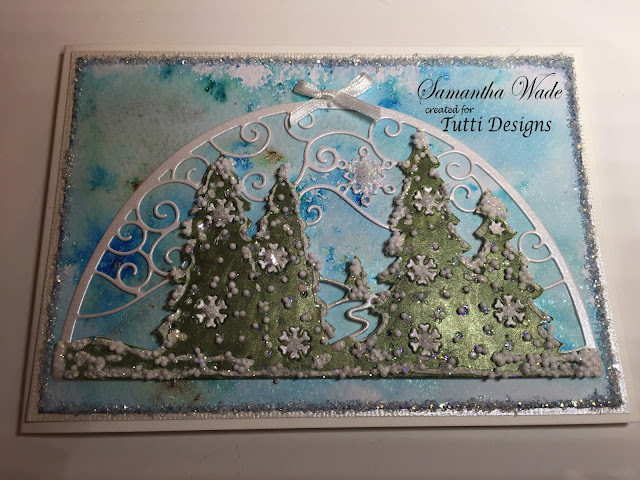 Along the top shape I have used the Arched Fir Branch & stamped & heat embossed with Wow Silver embossing Powder..."From Our House To Yours"
This card was very quick to make..
Hope you like this card enough to have a go yourself. Please stop by each day! you will see amazing design teams inspiration. Welcome back Tutti bloggers. 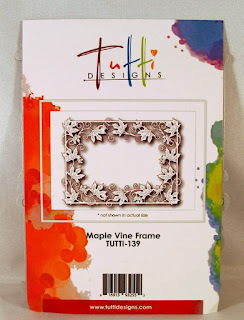 I am excited to share with you this gorgeous Maple Vine Frame from Tutti Designs. It was easy to cut out and I used Copic markers to color the leaves and vines. Afterwards, I used a clear embossing powder over the leaves and vines to give it a little shimmer. I added an Antique Gold seam binding ribbon bow and Wild Orchid Craft daisy in the center of the bow. It's Nancy Nickel here with a new Tutti Designs DT share! 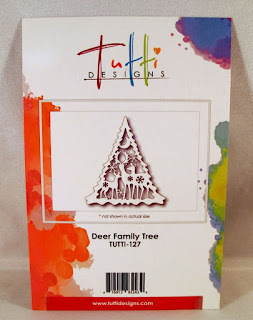 This time I'm using the beautiful "Deer Family Tree" from the July release. I cut this beautiful tree out of white adhesive backed glitter foam. All the bits came out as smooth as could be. I reserved the three snowflakes and placed them on the card base. Here you can see the pretty glitter on the foam. 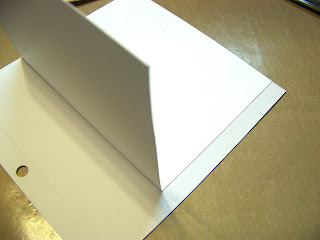 The card base is a really pretty green shimmer cardstock. I added a pretty sheer ribbon bow. and cut it into a banner shape. I gave it a bit of a curl and added it to the bottom of the card! 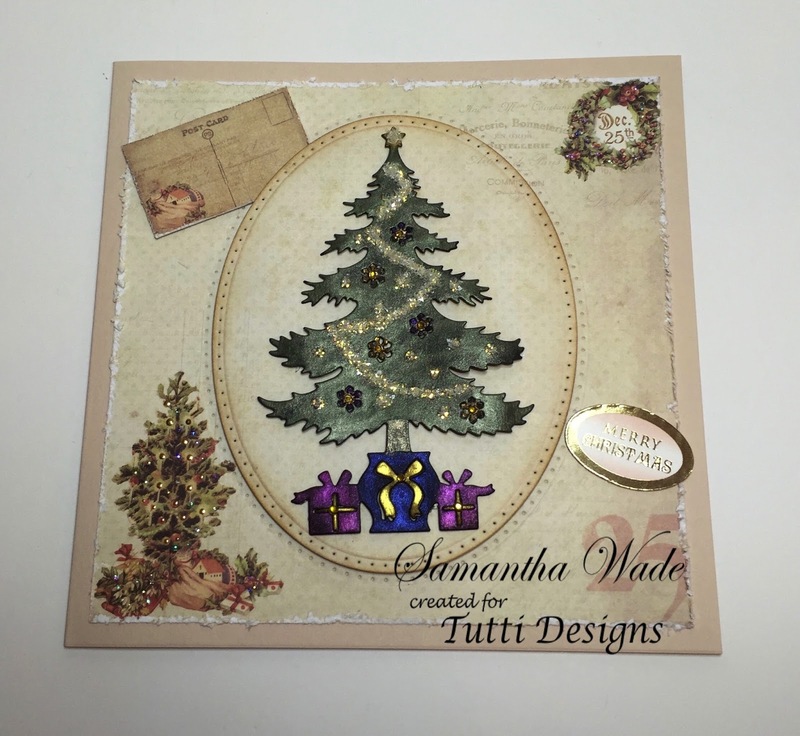 Darlene with you on this beautiful Sunday and I'm having so much fun with this July release of holiday dies from the Tutti Designs Store. I'm also excited to know that I will should have plenty of holiday cards completed early this year with the help of these beautiful dies. 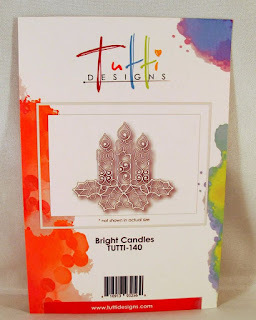 Today I'm using the Tutti Designs 'Shining Candles - (Tutti-138)' die. Here are a few steps that were taken in creating today's card inspiration. I hope you like it. First I created my 'picture panel' by die cutting an oval then cut another oval of the same size + one size larger to create my outer frame. By using some clear packing acetate from other crafting products, I was able to create my 'window'. Double sided tape was used to adhere it to the BACK of my oval cut panel. BACK of my oval cut window panel. Using dimensional tape around this panel, adhere it to my white card base. Now comes the fun with our SHINING CANDLES die cut! First I die cut it from white card stock. Then, carefully colored the poinsettia pieces & greenery with my Spectrum Noir alcohol markers while it was still in the die ... hence the little white edges. 'reassembling' my poinsettia & greenery. 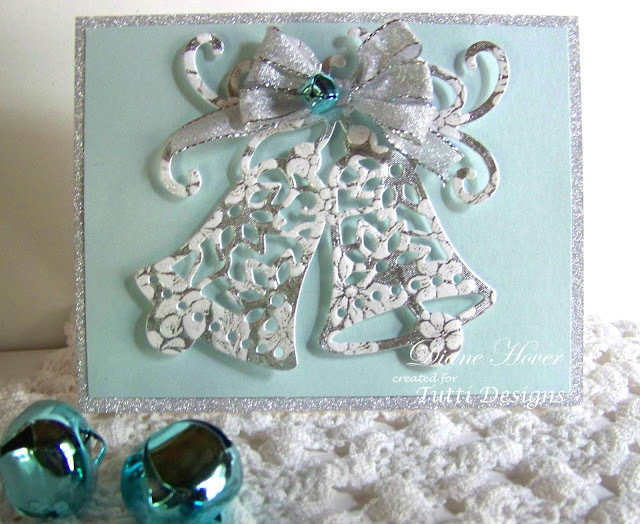 A few touches of sparkle and my card is ready to mail. 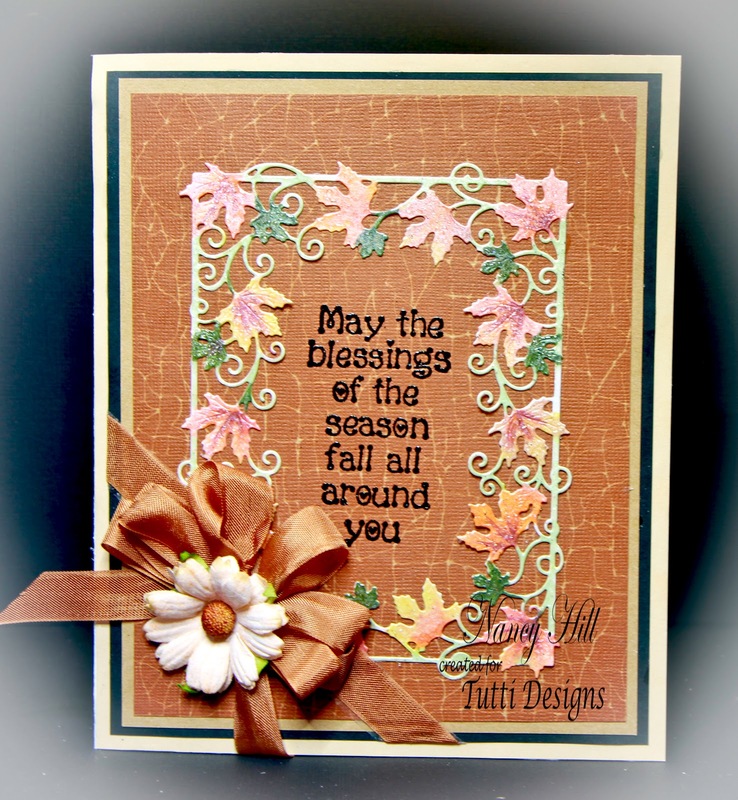 Make sure and check out all the great places to see this new line of dies. Thanks for stopping by today and here's wishing you a FABULOUS week ahead! 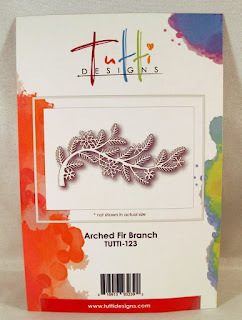 Don't forget, a design team member has a brand new sample using Tutti Design dies posted here on the blog EACH & EVERY DAY for your inspiration. Please stop back often! Today is Gifts Under The Tree, TUTTI-131. The die has been used with black card and coloured with iridescent shimmering paints. Once coloured mounted onto a oval. 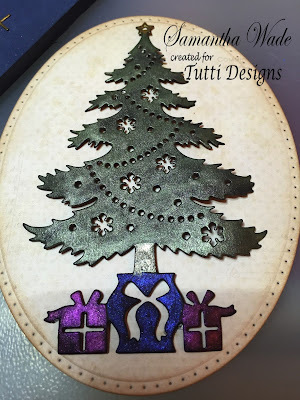 Add glass glitter and sparkle to the tree and glued the other die cut parts to the tree. Then mounted onto a festive background from my stash. 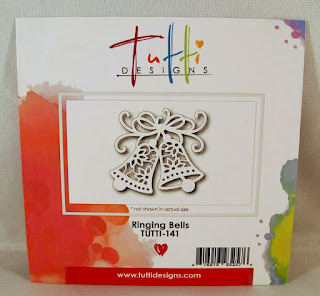 I have another new July release die to share with you today. This one is Scrolly Deer Edge. 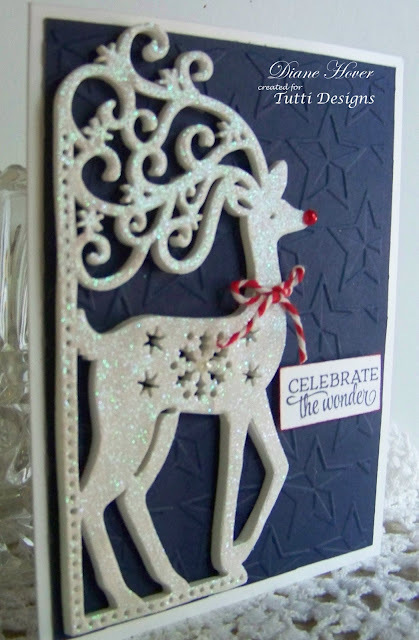 I started out by embossing a navy blue star background. then once again from a white craft foam. so if you don't have it perfectly lined up, it won't show). then adhere the entire piece to my background. Here is a side view to give you a better idea of the foam. and a red and white striped twine bow. A sentiment was added to finish.